Once Upon a Twilight! : 8 Ways 'Triple Moon' Overlaps with 'Witches of East End'! 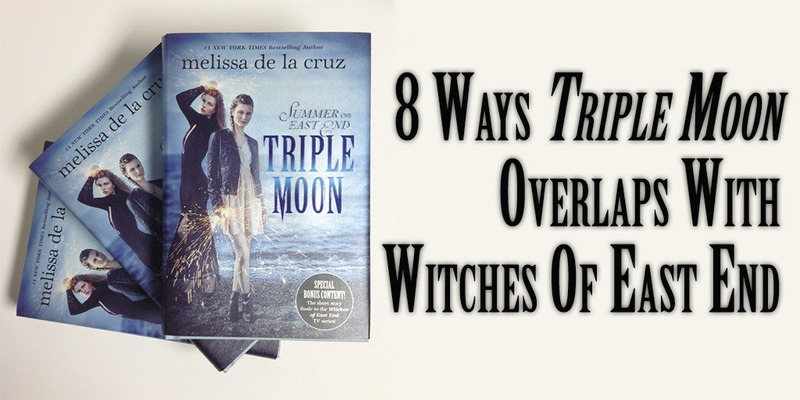 8 Ways 'Triple Moon' Overlaps with 'Witches of East End'! Twin witches Molly and Mardi Overbrook are the stars of this story, and their adventures start when they’re shipped off to live with their “aunt” Ingrid to learn to control their powers. Still working at the Inn, still gorgeous, still loving her freedom. And now, the gorgeous clothes she’s saved through the decades have new superfans – Molly and Mardi. While sisters Ingrid and Freya had to play catch up with their magical powers once they learned they were witches, Molly and Mardi already know they’re witches – and they don’t want to be held back. However, failing to rein in their magical impulses could land them in Limbo. Get ready to delve back into the mist-shrouded, lush town Ingrid and Freya first learned THEY were witches in, and the perfect setting for a tinge of magic and a dash (see what we did there?) of romance. Yes, the mansion is still alive and well – and wild parties are still the norm. A night at the Fair Haven will always be a night to remember…whether that’s a good thing or a bad thing. Prepare to meet a new crop of the oldest and wealthiest of North Hampton’s clans in the younger Gardiner boys Trent and Tris, who might just stir up as much trouble with Molly and Mardi as their older kin did with Ingrid and Freya. Can’t wait for more from your favorite world of witches? Get your copy of TRIPLE MOON here!